As I had previously mentioned in my tribute to Bullfrog Games, Dungeon Keeper was definitely one of my favorite PC games back in the day. The way that it turned the tables and had you running the dungeon for heroes to invade was a great spin on things and a twist on the whole genre. Thus it was more of a city-building style game that had you preparing for the inevitable invasion of the heroes at the end. Dungeon Lords surprisingly tried to capture that same experience in a board game and what you have is a pretty complex experience that also has you preparing your dungeon as best you can before the heroes come searching for adventure. And there are so many elements at play in this game that can make it feel like a bit of a logistical nightmare, but you can only do your best to manage things such that you don't suffer as much as the others. Dungeon Lords is a worker placement game created by Vlaada Chvátil and published by Czech Games Edition. The game supports 2-4 players and the Happy Anniversary edition of the game includes the Festival Season expansion along with premium components such as metal coins and additional decal stickers for game components. The game is played across two years divided into four seasons (rounds) of play as each player does their best to setup the best dungeon. This is done by hiring monsters, building rooms with additional benefits, purchase traps and dig tunnels. The whole time the heroes will start to gather at everyone's dungeons based on how evil everyone is with stronger heroes braving more evil players. But they won't attack until the end of the year, so seeing them gathered above your dungeon is both a threat and also a map for planning your strategy. However there are several constraints in how actions are selected. First they involve a deck of cards with the different action spaces and players nominate three cards they hope to accomplish. The caveat is that from prior turns two of those cards remain locked thus your options are limited. Then there's the action board itself that typically has one less space available than the number of players. Thus even if you played the card, turn order and card sequence may result in you getting locked out of the action you wanted to do since everyone else has gotten there first. What I Liked: The game has so many moving parts that managing it all can leave you feel pretty proud of yourself regardless of what the heroes end up doing to your dungeon. And that's where a lot of the fun between players really kicks into gear once you realize that you may have wasted an action card since everyone has taken the action slots you wanted to do. Then the actual hero attacks is when everything comes together. Similar to Vlaada's other game, Galaxy Trucker, there's not much you can actively do to help your minions defend your dungeon so it becomes more about how well you prepared your dungeon specifically in anticipation of the heroes that had gathered above your home. And let's face it, things have to be slanted in favor of our heroes so the dungeon lords can only really make the best out of an inevitably bad situation. And this anniversary edition really adds a nice feel to the game given the beautiful metal coins and other bonuses. It's a great bundle for a clever game. What Could Be Better: The many elements of the game are both its greatest joy and perhaps it's biggest hurdle. The learning curve for this game is a pretty steep and we've had to invest a lot of time in teaching new players how to play. And the real fun won't come in until players get to a point of comfortable experience - something that won't happen even after your second play. It's just one of those games that are pretty daunting but you are pushed to try harder because the theme and experience is just so fulfilling. The limitations of actions is a clever move but it tends to result in very limited dungeons there's definitely that urge to want to end up with more complex dungeons. The room placement rooms are a lot harder to accomplish because of the reality that you won't be able to explore as much as you'd like. I understand it's control mechanic that ensures dungeon growth follows certain patterns so your dungeon at year 1 has a chance to defeat the heroes without being too strong. But a guy can dream, right? 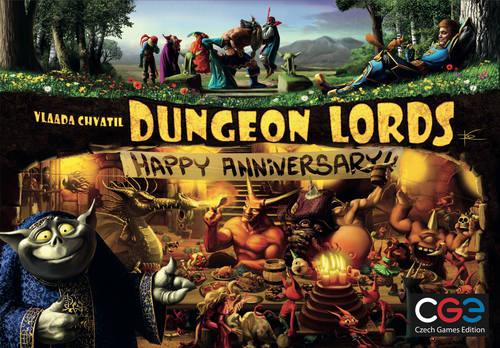 TL;DR: Dungeon Lords: Happy Anniversary is a great collection and also probably the best way to experience the game. It's not the easiest game to dive into but it does offer a very fulfilling game experience in the long run that you'll want to come back to. Thus it gets a great 3.5 imps toiling away in your dungeon out of a possible 5.